NEW YORK -- Two significant new video campaigns battled it out for the top slot on Advertising Age's weekly viral video chart: Google's "Chrome Speed Tests" and Toyota's "Swagger Wagon." Both got some blog coverage last week; Google because its Chrome browser is taking share in the web browser market from Firefox and Microsoft's Internet Explorer; and Toyota because, well, since when do you use YouTube to sell a minivan? Each video gathered a bit more than 1.8 million views last week. Google is no stranger to the chart, compiled by the affiliate of Automotive News, and has proven itself adept at creating and distributing videos touting products like Chrome, the Nexus One and new search features such as Googles. The Toyota video was created by Saatchi & Saatchi and directed by Eastbound and Down producer Jody Hill. 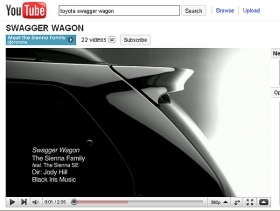 Toyota's "Swagger" video is part of the larger "The Sienna Family" campaign, which has been running on TV since February. Toyota's Sienna YouTube page has 10 other videos telling the hilarious backstory of the family, all with more than 100,000 views apiece. And yes, if you'd like the MP3, Toyota will give you that too. The campaign itself is a notable bit of humor amid more serious efforts to rescue Toyota's battered brand. In all, there were five new campaigns on the chart this week, including work from Google, Toyota, TomTom GPS and Gillette.